Your MicroSquirt® EFI controller should be mounted in a cool, dry location. The electronic components cannot withstand temperatures over 185°F (85°C), and will last longer if kept cooler. 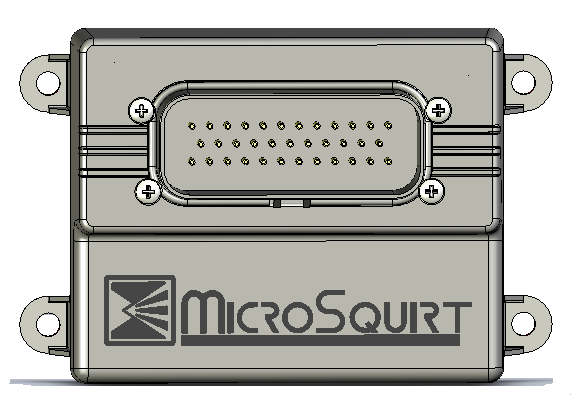 DO NOT install your MicroSquirt® controller under the hood of your vehicle. The overall length of your MicroSquirt® EFI controller enclosure, including mounting tabs, is 4.71" (120mm). The case width is 3.13" (79.5mm) and the height is 1.67" (42.4mm) to the top of the Ampseal connector (not including the harness and its connector). The dimensions of the mounting hole pattern are 4.20" by 2.14" (107 x 54mm). These are center to center hole spacings. The hole diameters are 0.20". Your MicroSquirt® EFI controller enclosure is 'water resistant'. The enclosure can be fully sealed by using sealer (silicon or similar) between the top and bottom sections of the case. The Ampseal connector already is sealed with its own gasket so just sealing the top/bottom case sections will seal it. Separate the case halves by removing the four (4) Phillips screws from the bottom side of the controller and gently prying the case apart. Then apply a sealer to the edges of the upper part of the case. Take care not to get excess sealer on the PCB or its electronic components. Then reassemble the case. It will be sealed once the sealer sets up.